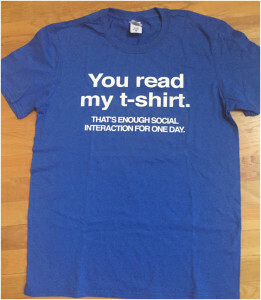 Yup, that’s the shirt I gave my sister a few years ago, as my way of finally showing her I understood and appreciated her need for quiet, for space, and for not sharing every thought she was having every second she has it. Like I have been known to do. We recently connected to talk about the book and about the way to make introvert/extrovert partnerships work better than ever. Be sure to check out the links at the end of this post to take Jennifer’s free quiz and get a free chapter from the book. You can listen to our chat below (20 min, 47 sec), or read the transcription (edited slightly for easier readability). Darcy: Hey everybody! I’m Darcy Eikenberg, the founder of Red Cape Revolution. I feel very fortunate today because I have the opportunity to chat with somebody who I respect, who I like, and who has a great message that’s been helpful to me, and I know is going to be helpful to you. That’s Jennifer Kahnweiler, who is the author of the brand new book called “The Genius of Opposites: How Introverts and Extroverts Achieve Extraordinary Results Together.” So let’s say hello to Jennifer. Jennifer: Hi, Darcy! Hi, everybody! How are you? D: I’m good, thank you. I’ve been looking forward to the chance to talk! Not only are you an author that I admire, and a speaker and a coach, but I also consider you a friend. I have learned so much from you, especially being someone who leans heavily on the extrovert side– even though I have my introverted moments! But some of Jennifer’s early works have really taught me a lot about working better with people who are more introverted. But you have a new book, “The Genius of Opposites.” So tell me what “The Genius of Opposites” is. J: Well Darcy, as you said, I’ve been working in the space of introverts and have become a champion of introverts these 10 years or so, where I’ve been working in organizations and individually with people who are more on the introverted side. As you’ve said, I’ve learned so much from their wisdom. As I was in this space—particularly as I wrote the last book, Quiet Influence, and I was hearing from readers and from people in my speeches. We need to open up the conversation. We know that we [introverts] have a lot of strengths—and by the way, that’s the message I try to always impart to introverts, is that you don’t want to become an extrovert. You want to rely on and leverage the strengths you already have and you bring to the table. So that really propelled me towards working and doing some more research for this book in terms of—well, how do we make it work? And like in my past books, what I’ve done, Darcy, is go back to the source. I put a call out to my networks for opposites: partners who have had successful work relationships. In some cases, they weren’t that successful but they had worked through a lot of the worst together. And what did they do? What was the secret sauce to get through that initial honeymoon phase, where opposites attract but they don’t always stay together? Marriages don’t always last as we know. D: And it’s such an interesting idea, because we do kind of live with that stereotype that opposites attract. But when I think about the type of people that you work with very often, or the type of people who just you feel like you click with, and often you get stuck in that, “hey, they think like me,” and yet some of the richest, most in-depth work that can happen is when someone doesn’t think like you. I love what your audience said–that the person who is missing in this room talking about introverts, is the extroverts. D: So, here you are playing with people in the room to say how both styles can actually participate and be better together. As opposed to –in the earlier work that you’ve done with introverts–there has been the feeling of “I have to pretend like I’m an extrovert.” Is that correct? J: Yes, absolutely. Absolutely, and that’s still the case with a lot of introverts. 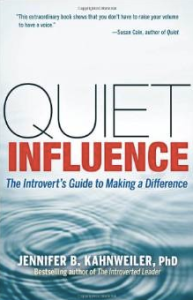 Part of the benefit of this whole—what I call “the rise of the introverts” where most people have heard of the book [Quiet] by my colleague, Susan Cain. If they haven’t read it, they’ve seen her TED talk. It’s in the water, if you will now. People are understanding—-not always totally correctly—but they understand what introverts are, so there’s more acceptance. The rise of the introverts has really been a positive thing for all of us, for sure. So I think that’s the platform we’re coming from now, as we look at how do we make it work between the two of us, because it is work. That’s what I found from my research, Darcy, that it is intentional work, when duos last, that when they have long term or even shorter term successful relationships, whether they’re in small businesses or whether they’re in large companies. They do follow certain steps that I identified and put into a model. You know I like models and processes, it makes it easier to sort of get a hold of. Really what they focused on was more the outcomes and the results that they did on the differences between them. I know that’s sometimes easier said than done, but I provide some very specific techniques and tools for what I learned and have learned from introverts and extroverts who work together well. What’s an Introvert and an Extrovert? D: Before we get into some of the techniques, maybe it would be helpful to the folks who are listening to just reiterate what really do we mean by introvert versus extrovert? We’ve tossed that term around a lot, and you’ve said it yourself, that there are some assumptions about what an introvert is or maybe even assumptions about what an extrovert is. But in your view, especially as you look at “The Genius of Opposites,” how do you frame up an introvert versus an extrovert? J: Well, it’s really, Darcy, around energy, and where you get your energy from. I didn’t make that up–Carl Jung, the famous psychologist many years ago came up with that idea, and it really makes total sense. The introverts get their energy from within, inside their heads. They thrive on quiet time, on taking that break. Extroverts, on the other hand, charge up their battery through other people and through the world outside themselves. It really is a spectrum. We have extreme introverts, like you’ve met my husband, Bill, and I use him a lot in my talks. Bill is a very pronounced and strong introvert, but most people are somewhat towards the middle. 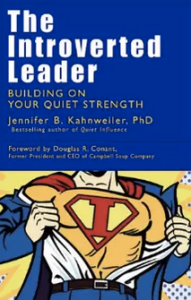 Jennifer’s first book, The Introverted Leader. Can you tell why we hit it off? You were talking before about having introvert strength. So I think back to the definition. It’s really for me, the deal breaker of whether you’re deciding if you’re an introvert or extrovert, is whether or not you absolutely need that quiet time, that solitude. If you say it’s kind of nice to have, then you’re probably not a strong introvert. You’re probably more on the extroverted side. I heard a great definition by a woman who works for the website Quiet Revolution, who said if you think you’re an introvert, you are. So you can’t be a wrong kind of introvert, you can’t be a wrong kind of extrovert. I think the real key to is about behaviors, Darcy, and what’s working for you. So I don’t want people to get hung up, “Oh, am I introvert or am I extrovert?” but for instance if you have an expectation that occasionally you’ll be seen at meetings and speak up, not just show up but speak up. One might say, “Oh that’s an extroverted behavior.” But that’s a behavior that works within the context of an organization. You have to look at what are the behaviors I want to add to my toolkit to be effective, even though I’m coming at it from an introvert or an extrovert place. I guess the other thing related to your definition question has to do with shyness. You know, Darcy, a lot of people right think that introverts are shy, and that’s usually not the case. Shyness does exist and people who are shy will tell you it can be very debilitating. It tends to be associated more with psychological or social anxiety, but introversion is about how you’re wired, as the same with extroversion. It’s how you’re wired and you can’t necessarily change an introvert, you can’t change an extrovert. That’s one of the first lessons, so don’t try to do that. D: I know that I’ve worked with people who would be defined as introverted before, and there is a feeling of “how do I be more like that person who’s getting the attention or is getting all the kudos” and trying to be something you’re not is never going to work for you. That was very interesting for me, because it gave me the awareness that we needed to create that time and give her that time, making sure we had that built into the program. We live in a world sometimes where it doesn’t feel like we have enough time— where everything’s really busy. And I’m a fast talker, and fast thinker, so checking my own behaviors and expectations. I was so glad that she was revealing and self-aware of that already to be able to help us work better together. J: That is really a beautiful example of what can be replicated in the workplace. I saw this with “The Genius of Opposites,” the latest book that I wrote is that, they talk about what’s going on so they have an open dialogue. Their partner is pretty clued in. They’re not making them be mind readers about what they need. There was one woman who’s actually somebody you might know here from Atlanta, Lisa McCloud, who is a speaker and she works with her husband, Bob. He’s her business partner, and Bob’s very introverted. She says she basically says to him when she lands off the plane, she’ll call him and say, “You know, I need to download,” and they have a real communication system between them. So if she says, “I need to talk to you,” and it’s not a good time, he’ll say, “Not now,” she doesn’t take it personally. But she says what she needs and she knows she’ll be able to do that later with him. I heard that time and time again, all sorts of clues and cues that partners give each other to have exactly the kind of clear communication that you talked about with your client. It makes such a big difference, and it seems so simple to do that on the surface but most of us don’t. We talk around the actual process and we really need to clarify what works for us, from our introvert/extrovert sensibilities. D: In the book, you create some steps. You have a process and structure of how, if I’m working with somebody who is my opposite, my introvert to my extrovert, that there is some ABC’s that help people get to the right kind of results. So will you take us through those and give some good examples of how they can work for both? J: Well I think that it’s always great to have a framework or a process, and my editor really helped me shape this. I’m very grateful to my editor. We came up with this ABCDE paradigm. A, the first one is Accept the Alien. That refers to not try to change your opposite. We’ve all been there, haven’t we? But you can understand them. Once you’re able to really do that, then you’re in for much less stress. So don’t try—you can’t change them. Once you say, “Okay, it’s not doable,” and I can’t think about relationships and marriages because it’s a good analogy or a good comparison to the workplace or partnerships that you have outside of work. And then, the second step is Bring on the Battles. This is seeing disagreement as necessary to arrive at the greatest outcomes you can, because you’re each challenging each other to come up with the best solution possible. I’ve termed that bringing on the battles and that’s really essential. J: Let’s face it. And the other thing related to that is that the client benefits. If we’re in a business, and we’re giving a client different views, and I’m not saying to have an all out war in front of the client, but we come up with more innovation, wouldn’t you agree, when we have conflict. It doesn’t happen if we don’t disagree—it’s normal. D: That’s what makes it interesting. Right? J: Exactly, and so we model that for the people on our team, for our clients when we actually do, in a mature way, bring conflict to before and I have a number of steps in that chapter about how to do that with maturity. You know, and that introverts and extroverts will surface that very well. They get past that. They also Cast the Character. They know each person’s role. That’s the C.
In this situation, they know what their strengths are, so you bring out the opposites best in each role. So the extrovert might play that sales role. The introvert might play the back office role. However, they do switch and they learn from each other and they share the credit. That’s really key. I have some examples in the book where that didn’t occur same as examples like Jonas Salk [the inventor of the polio vaccine], who didn’t share the credit with his team, and then suffered the negative consequence of that of his whole career. That’s really important that when we cast the character, we put people in the right roles, and we’re really zooming and reaching results that we don’t try to hog the spotlight—that’s key. D is Destroy the Dislike. That was kind of a hard one to come up with in terms of the terminology, but what it really is, is about friendship, Darcy. I found over and over again, when you respect each other, these partnerships acted like friends. They talked openly and the most important thing was they had fun. They enjoyed each other. D: And you know who he was saying that about, right? The extrovert, right? J: Right. But I mean that’s the thing. You laugh, they laugh, and that’s when work gets done when we have a good time. That was a hallmark of these relationships, that they had fun. They just kind of rib each other. They don’t necessarily have to be best friends out of work and hang out all the time. But you act like friends—that’s the key. And then the fifth one is Each Can’t Offer Everything. That’s understanding what your limitations are—that you can’t offer everything to clients and customers, that for true diversity, you really must work in concert to provide the widest range of options. It might even be bringing in other people to serve you or your customer or client. So I think understanding, being humble, and having some humility, really does make a difference. 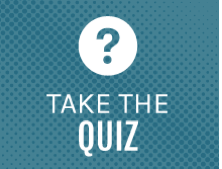 So I think if you take a look at where you are with your partner, and use this as a framework through the quiz that we offer on the website, I think it’s a great jumping off point to see what you’re doing well, what’s working and where you might sort of fine tune your partnership. D: So tell me more about the kind of person who will benefit from the quiz. Somebody who is already is in a partnership , or works with people that are opposites from them? J: Well, if you think about it, it’s really for everybody, because we’re all working with people who are opposites than ourselves. It may be a short-term project that you’re working on, or a customer you’re calling on who has a different style than you. So it’s for anyone who you’re interested in continuing to strengthen the relationship, and that would cast a wide net. You could look at it for an ongoing partnership that you have or one that you anticipate in the future. So in any case, it’s going to get you ready for the next one. D: Yes, and I love the fact that there’s a quiz on your website at JenniferKahnweiler.com and we’ll put a link to it in the transcript, in the blog. It’s jenniferkahnweiler.com/genius-of-opposites-quiz/ in case you’re just listening. But you can always go out to JenniferKahnweiler.com find and take the quiz. It’s the middle of the page. And Jennifer, your team is sending people back ideas about how they come out with each of those ABCDE’s, right? J: Yes, absolutely. You come up with a score description, how you’re doing and some suggestions for next steps. And then the book itself was written very much in—I guess like my other books—to be very prescriptive, very tool-oriented, so it’s short. You can pick it up actually and read it. Start in any chapter if you’re trying to get kind of a quick feel, and then at the end of each of the five chapters that describes the process, there’s tips and questions to consider, plus the summary. So I think you can take that and run with it. It might be good to also share with your larger team as well. D: I love the fact that it gives you questions to consider and pieces to work through each of the sections. So Jennifer, the book is coming out shortly. By the time people see or hear this, it’s already available on Amazon, correct? Jen: Right. It is, Darcy. We just launched a brand new website with a lot of resources and articles that people might want to look at and visit us and be part of our community. I’m also very active on Twitter, also have a Facebook page under my name. So Twitter, it’s @jennkahnweiler, and I’d love to communicate with you there. D: Well, the new book is “The Genius of Opposites” by my friend, Jennifer Kahnweiler,who is a PhD, as well as an all-around good person and everything else! We’re so excited to share how introverts and extroverts achieve extraordinary results together. I know I always learn a lot, and it wakes me up to recognizing that not everybody is like me. I really want to make the most and be respectful of my friends and my colleagues who are introverts, and have different skills and strengths than I do. That’s what makes it all great to work together. So terrific. Well, Jennifer, any last words before we wrap up here? Any other thoughts on the book or some of your learnings from writing it? J: Well, we’re better together and I really want to end with quick quotes if I may. Thank you, Darcy, for asking. Thank you for making a difference in the work that you do which reaches so many people. I think when Genius Opposites are working, that’s the picture that you see, and I really am hopeful that we can strengthen even more those in the world. So thank you for helping do your part in making that possible, Darcy, and for the work that you do. D: Thank you and thanks for being here today. 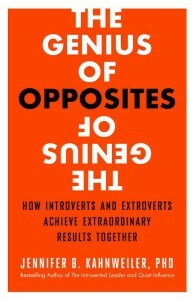 Again everybody, the book is “The Genius of Opposites: How Introverts and Extroverts Achieve Extraordinary Results Together” by Jennifer Kahnweiler, our guest today. 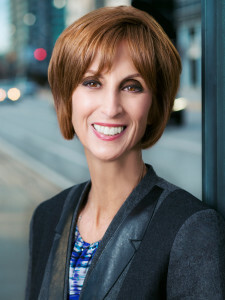 I’m Darcy Eikenberg, the founder of Red Cape Revolution. We thank you for being here today and hope everybody has a great week. Go out and find your opposites. Find some genius within these relationships. Take care, everybody. Have a great day! You can download a free PDF or audio chapter of “The Genius of Opposites” here. 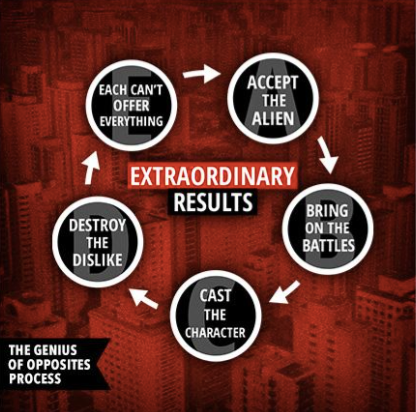 YOUR TURN: How do you make the most of the genius of your opposite? Tell us in the Comments below, or join the discussion on Facebook or LinkedIn.